Fortunately, over the past 10 years, it's gotten a bit easier to request a gluten free meal on an airline. But it is nice when it all comes together and you can get a decent (and safely gluten free) meal on a plane. I always check the policy of the airline and then either put the notation in the system when booking the flight -- or call the airline directly to make the request. It doesn't hurt to do both -- and confirm about a week before the flight that they have the information correct. Always scrutinize the meal before digging in. Many years ago, one airline put a gluten-laden roll on the tray with the gluten free meal. That made us call into question the entire meal. Registered Dietician-approved meals are available for "gluten intolerant" passengers on most domestic flights when a full First Class meal is provided. They are also available in all classes on flights to/from Europe, Asia, Australia, New Zealand, and select South American countries. Requests for special meals must be made at least 24 hours prior to your flight and can be done on their website or by calling reservations. 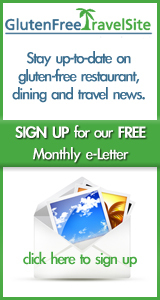 "Gluten intolerant" meals are available in all classes of service on all international flights where a meal is served. Within North America, gluten intolerant meals can be requested in Premium Economy or Business Class. Special requests must be made at least 18 hours in advance of the first flight in your itinerary (unless it is a flight departing from Germany or Switzerland, in which case you must give 24 hours notice). To request a gluten intolerant meal at the time of online booking, go to the Passengers page and simply select the special meal you require from the MEAL drop-down menu when entering your passenger information. If you have already completed your online booking, contact the airline at the phone number listed above. Jet Blue does not offer specifically prepared gluten free snacks or refreshments during flights. However, there are several in-flight, complimentary snacks to choose from, some of which (depending on availability) may be gluten free. "Gluten intolerant" meals are available upon special request on all trans-Atlantic, trans-Pacific, and most intra-Pacific flights, as well as on flights to Argentina, Brazil, Chile, and Peru. Special meals are available on most North American premium cabin flights 2,000 miles or longer. Some special meals not be available in every market. You must request a special meal at least 24 hours prior to your flight. You can submit your request online if you sign into your MileagePlus account, or you can call the phone number above. Gluten free items are available on flights including meal service. You must request special meals at least 24 hours prior to your flight. Requests can be made by phone or online when making reservations or by calling the phone number listed above. Southwest does not serve full meals or take special, gluten-free food requests. They do, however, serve in-flight snacks -- some of which might be gluten-free depending on availability. Travelers are welcome to bring their own snacks with them. Special gluten free meal orders can be placed for all intercontinental flights and some other specific flights (see the webpage linked above for more information). Requests can be made when booking your flight or no later than 24 hours before your departure. You can also make the request in the "Your Reservations" section of their website. British Airways does not guarantee that any meals are free of any trace allergens, including gluten. However, you can request a gluten free meal when traveling in any cabin on long haul flights -- and in the business (Club Europe) cabin on short haul flights. If you do make a special meal request, it can be done online through "Manage My Booking." A minimum of 24 hours notice is required for all special meal requests. If you are traveling on standby or are on a wait list, you will not be able to request a special meal. Swiss Air offers special meals, including "gluten intolerant" meals, on all their long haul flights, and in SWISS Business on selected European flights. You can request your special gluten free meal during your booking online, or you can contact then via their Service Center (phone number above). The airline requires at least 24 hours notice before departure. Swiss Air recently became the world's first certified "allergy minded" airline, earning a quality seal of approval from the European Centre for Allergy Research Foundation (ECARF). Their galleys are stocked with various lactose-free and gluten-free products. Visit their website for more details. Hawaiian Airlines recently began making gluten free meals available on all international inbound and outbound flights, with a couple exceptions. You must make your request at least 48 hours prior to your flight. To pre-order a gluten free -- or any other special meal -- call the reservations department at the number above. You are also welcome to bring your own meals on board. Flyers on Qantas are able to request special meals in line with their dietary needs. In addition to a special meal for "Gluten Intolerance," they have various versions of vegetarian meals available -- and also vegan, kosher, halal, diabetic, and infant and child meals. Special meals must be requested at least 24 hours before departure, except for Kosher meals, which require at least 36 hours advance notice. Special meals are not available in Domestic Economy. You may note your special meal request when booking with an agent or go to the Manage Your Booking page of the site and choose Passengers and then Edit. Again, this list of airlines is by no means exhaustive, so please feel free to share any other airlines you've had a positive -- or negative -- experience on, along with the details of what they provide. If helpful, we will add that airline to our list above.